When it comes time to uninstalling applications which you no longer need, some of those applications can be really difficult to remove. Among those which fall into this category are anti-spyware applications, firewalls and most notorious, antivirus software. With AppRemover, you can easily uninstall and completely remove titles like Norton Antivirus, Avira, AVG Antivirus and BitDefender. AppRemover is completely portable (meaning you can use it without installing it) and it can remove a list of program at the same time, making it a Batch Uninstall Tool. Version 3.1.34.1 is a freeware program which does not have restrictions and it's free so it doesn't cost anything. 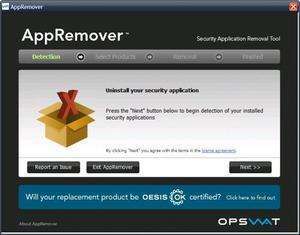 For security reasons, you should also check out the AppRemover download at LO4D.com which includes virus and malware tests. Additional screenshots of this application download may be available, too. 4.5 out of 5 based on 54 ratings. AppRemover download been highly rated by our users.